And, after a turgid encounter, it's only fair we end with the man who at least salvaged us a reminder that 4pm on a Sunday can throw up genius moments. Hard lines Stoke fans, there was plenty of endeavour and Ibrahim Afellay promise to at least see some light at the end of the tunnel. Thanks to all of your for the tweets and texts today. You've been blinding. read about Arsenal's defeat here and keep your eyes on the BBC Sport website later for features such as the Garth Crooks Team of the Week. But relax, there's 37 games to go. Stoke City: 15 August, Tottenham (away), 22 August, Norwich (away), 29 August, West Brom (home). Liverpool: 17 August, Bournemouth (home), 24 August, Arsenal (away), 29 August, West Ham (home). Anthony Amodeo: Still scared to go forward and slow on the ball. No difference from last season. Rodgers has until Christmas to save his job. Craig, Wigan: It didn't matter how Liverpool played today. After last season, and whilst the players settle, it's about results. More from Liverpool manager Brendan Rodgers: "It will take time for all the signings to settle in, but a victory helps and I was delighted with the all round team performance. Benteke showed his quality, Milner was so energetic in midfielder and Gomez is only 18 but stood up well to Jon Walters. Clyne just cruises through games. "Always felt last season's result at Stoke was a one off. The players can put that behind them now and focus on moving forward." Liverpool manager Brendan Rodgers: "It was a good performance after a long pre-season, to get the win after what happened here last season was even more important. We showed great character and determination as a team and our quality came through. "Coutinho did very well, he has only been back three weeks but he is at a good level of fitness. He did a wonderful spin to get away from Glen Whelan and then got the shot off which beat Jack Butland who is an excellent keeper. It was a wonderful goal to cap a really good performance." A look at Liverpool's next six away game perhaps emphasises why that late Philippe Coutinho goal could prove quite handy. On their travels, Liverpool now go to Arsenal, Manchester United, Everton, Tottenham, Chelsea and Manchester City. You may recall we told you earlier that Inter Milan's Xherdan Shaqiri was in the stand at The Britannia Stadium. Stoke bid for the Switzerland international during pre-season and it seemed he was allowed to leave the San Siro but was hesitant. Hughes has had this to say: "It is a deal we hope to conclude and we would be delighted but nothing is certain in the transfer window." Stoke manager Mark Hughes: "I do not think any team deserved the win, a draw would have been the fair result. "Liverpool have invested a lot of money this summer but I did not see £80m worth of difference between the teams. We are at a good level without going into the transfer market too much." "We will get stronger and be more creative. In terms of the performance as this is the first day of the season I am quietly confident we can go on from this point." There's a lot of love for Philippe Coutinho on Twitter. Mark Wright adds "special goal, special player". Did you know? 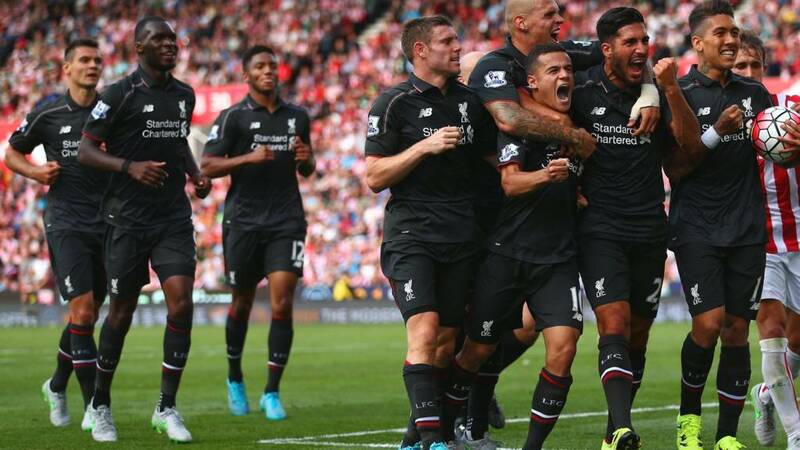 Three of Coutinho's four goals in 2015 have come from outside the area? So Stoke fans and Liverpool followers, has that game made you think anything different about your prospects? Stoke manager Mark Hughes has just referenced Liverpool's summer spending and claimed he could not see £80m of difference between the two teams. A major positive for Stoke will be the performance of Ibrahim Afellay. The summer recruit was well involved and completed 88% of his 42 passes. More impressively, he found a teammate with 90% of his passes in the Liverpool half. It's a funny old game. This was by far and away one of Philippe Coutinho's average recent performances in a Liverpool shirt but the headlines and positives will focus on the 23-year-old. Coutinho had 63 touches and only completed 71% of his passes and manager Brendan Rodgers has just told Sky Sports he was about to take his match winner off when the goal arrived. Interestingly, Coutinho looks like being more and more of a central figure if his touches are anything to go by. There was a time where he'd occupy a wide role but today he threatened the heart of the Stoke defence. Liverpool captain Jordan Henderson speaks to Sky Sports: "We knew it would be difficult it's hard place and a good team. But we've worked well in pre-season and I think we showed the resilience today before Philippe came up with a bit of magic. "I was behind the shot, I Knew he would make the keeper work, he does that in training everyday so there's no surprise to us really. "I always believe we can create chances so I knew we'd get a chance to win the game and thank fully we did. It's one win, one game at the end of the day so we have to keep working hard." Noel Fitzpatrick: Yes we get three points, but let's not kid ourselves, that was a turgid mess! Paul Murhpy: Does Coutinho only score stunners? Abhishek: Goal of the season award might be too soon. But goal of the month definitely. Did they deserve that? It's tough to say Liverpool merited a win but certainly in the closing quarter they looked to have a little more impetus than their hosts. With eight shots, they had one more than the home side. A very tight encounter but all that matters come May is the points tally (and sometimes the goals one). "It's been a very drab game. Extremely dull - it's been a bit of a dog's dinner at times - but the goal was absolutely top class. The turn on Glenn Whelan was brilliant - that gave Philippe Coutinho the space to run on goal. "The thing is that Coutinho has done that on quite a few occasions, and it's nearly always the same goal - cut in from the left and bend it round the goalkeeper with power into the top corner." The hugs - and a lot of them - are for Philippe Coutinho. It's a bear hug from Simon Mignolet and the Brazilian is full of smiles. Brendan Rodgers strolls in his black suit, black tie, down the touchline and down the tunnel. A hard away test navigated. Liverpool's early away games are extremely tough, I'll bring you a list shortly but this win is very, very handy. Can Glen Johnson launch an attack down the right flank, he finds Jon Walters but Joe Gomez is still going strong on his full debut. He squeezes the ball out for a throw. here come Stoke one last time... NO. Whistle blows and Liverpool have nicked three points. Out comes Simon Mignolet to scoop up a Stoke flick on. That's ownership goalkeeping. His side have a throw deep in their half... 60 seconds. Stoke have the ball deep in their half, Liverpool have two minutes of stoppage time to hang on. They look comfortable. Peter Odemwingie swings in the delivery with a tonne of whip... goal kick. A waste. Around 90 seconds to go and James Milner heads for the corner flag but gets robbed of possession. Stoke force a free-kick in the Liverpool half. This will go in the mixer. Samuel Ball: It's always Philippe Coutinho. Impeccable strike, this is his season! "Philippe Coutinho was under all sorts of pressure from Glenn Whelan but turns and crashes the ball past Jack Butland. It's been one of the dullest games you will ever see, but that is what Coutinho does." Oh how about it? How about it? A dire game needed something we could remember it by and Philippe Coutinho has obliged in stunning fashion from 25 yards. He receives the ball from left-back Joe Gomez, turns in field and lets fly, dipping the ball over the dive of Jack Butland. A super strike and he goes absolutely mental in front of the away fans. "Martin Skrtel and Dejan Lovren, both of them were just stood there with their hands in the air, but Mame Biram Diouf was definitely onside. Would Brendan Rodgers be pleased with 0-0? I'm not sure pleased would be the description. Satisfied is probably better." Glen Johnson, down the right, cuts in on his left foot to dink a cross... MAME BIRAM DIOUF... wide. A good opening and it's a corner as the striker was beaten to the ball by his marker who glanced that ball around two feet off target. David Simpson: Personally an away 0-0 draw with Stoke is a good start. Clean sheet and room to improve. Brilliant block by Martin Skrtel. Marco van Ginkel pulled the trigger in space 18 yards out by Skrtel dived on it with conviction. Proper defending. We might yet get a winner. "After the substitutions Liverpool seem to have gone even narrower. I can understand why the changes have been made, but it's always more difficult to try and play through a side rather than around them." Liverpool fans loved the news the club had been bold and signed a Brazilian who, let's be honest, the vast majority of general football supporters had never heard of. 'Bobby Firmino' in true Scouse language, looks like a bit of a contributor as during his time with Hoffenheim in the Bundesliga, he scored 38 goals and set up 24 in 140 games. Sorry Philippe Coutinho, I can't let this slide. Before the substitutions the Brazilian hit one of the worst shots I've ever seen. It was laced with power but probably cleared the stand as is on its way to Norfolk as we speak. Woeful. But clinically woeful. Here come the changes... Jordon Ibe off... Roberto Firmino makes his Premier League debut. Peter Odemwingie on for Ibrahim Afellay and Steve Sidwell is introduced for Charlie Adam. Emre Can crosses the halfway line, his introduction into a deep midfield role has seen James Milner moved forward. Good ball by Can, Christian Benteke is in behind is he? No. He lacked the turn of pace and gets well blocked by a team of Stoke defenders. Is this clever by Brendan Rodgers? The game is just opening up and now we are about to see a man known for an assist during his time with Hoffenheim? Can he do it on a sunny Sunday in Stoke? James Milner and Jordan Henderson combine sweetly as Henderson runs behind Stoke's back line but his volleyed cross is five yards too far ahead of Christian Benteke. More Liverpool pressure though, they are seizing the initiative here. "A football match has broken out, which is good." The Potters - Stoke City's nickname - is as I'm sure you aware born out of the rich pottery history the city has. How and why did the region become famed for this product? It is located in an area which was rich with coal and clay and the later construction of the Trent and Mersey Canal lent itself to different varieties of the material being brought in. Back in the 17th century, Stoke was to pottery what the sea is to surfing and the industry is still well represented in the city to this day. Oh hello, woken up have you gents? Took an hour but here we go, circus stuff. Philippe Coutinho with a sumptuous touch in midfield sets the pattern, he drives at the heart of Stoke's back four and as the ball is nicked away from the Brazilian, Christian Benteke sees a shot blocked. Suddenly Liverpool sense momentum and Martin Skrtel meets a corner to prompt Jack Butland into a save for the cameras. He stayed in the air for 15 minutes and smiles before catching that one. You can't fool us Jack, that was regulation. "That is a very good save - because Simon Mignolet had to wait and see if Mame Diouf would manage to make contact on the ball. The Belgian reacted very quickly to turn the ball away." ACTION. ACTION. We've been starved but seconds after Dejan Lovren shoots straight at Jack Butland from range Stoke come mighty close to a breakthrough. It's a whipped Charlie Adam free-kick which Mame Biram Diouf stretches to meet but Simon Mignolet turns the ball away. Diouf was 10 yards out and central, that's the game's best chance. Adam Lallana will want to offer more than he did last season at Anfield. His opening foray this term brought 31 touches but just 71% passing accuracy. As vintage as the fizzy wine you see at an office party. Liverpool make their first change of the season but it's not Roberto Firmino or Danny Ings, it's Emre Can on for Adam Lallana. Peter Stark: Really worry about creating goalscoring chances with midfield of Milner and Henderson. Solid yes, creative no. Roland Hagan: Long ball Liverpool anyone? The midfield battle continues and Stoke win a free-kick on halfway which Charlie Adam hits to absolutely nobody. Goal kick. A goal looks less and less likely as quality refuses to shine through here. An error or wonder strike is needed. Glen Johnson races forward down the right and can cross can eh? No. Adam Lallana concedes a corner... no... referee says goal kick much to Johnson's visible anger. "Liverpool have bought all these players to try and solve the goalscoring crisis from last year but there's nobody in the box. Christian Benteke is the only player in there." Did anyone see Rudy Gestede's winner for Aston Villa yesterday? The boy can't half whack a ball with his head. Alan Shearer informed us on Match of the Day that no striker in England has as many headed goals as the 6ft 4in striker over the last two years. So is Peter Crouch's throne under threat? Since the retirement of Dion Dublin I think I speak for all when saying Crouch is the poster boy for headers in the Premier League. No player in Premier League history can match his 47 headed goals... yet. Crouch is on the bench and will probably play some part against his old club. This really is tight. Possession is locked on 50-50, Stoke have ran a collective 63km, Liverpool 62km. Nothing in it. Someone needs to produce a moment of quality but Adam Lallana's cross is the direct opposite of what's needed. Way over Christian Benteke's head. This game looks like it'll be won by pouncing on a loose pass or error, Liverpool try their luck as Stoke relinquish possession but Nathaniel Clyne's cross is diverted for a corner. Jack Butland gets a punch on the delivery, job done. Dejan Lovren, clad in tattoos, is booked for what looks like a coming together with Mame Biram Diouf but replays show he landed a glancing elbow. That was pretty ugly and treatment rushes on for the Stoke striker. Lovren could count himself lucky. Diouf is absolutely furious. That's a red card in the eyes of some officials - not Anthony Taylor though. Jordon Ibe has some nice dancing feet and his bright orange boots are mesmeric. He sizes up Philipp Wollscheid with a jink and feint, he's like a boxer throwing fake moves to unbalance his man. The good work gets the ball to Philippe Coutinho but his ball through for Christian Benteke is heavy. Marco van Ginkel from 20 yards... that's practically a back pass. Tame. Simon Mignolet threw his cap on it. Here come the players and a substitution is afoot for Stoke City. Philipp Wollscheid is stripped and does some kick-ups. The central defender is coming on for Erik Pieters who looked to be struggling late in the half when he needed lengthy treatment. I'm not big on defenders in white boots and Wollscheid is one of that breed. A look at the pass completion figures in that half are frankly depressing. Both sides are averaging 76%, give or take a decimal point here or there. That's not great. The only midfielder who can hold his head high is Jordon Ibe with 91%. He completed nine of his 11 passes. John Dunthorne: How do Liverpool intend to use Benteke? The first 30 minutes show they are not set up to play to his strengths. Too isolated. Benteke has had 22 touches in that half. That's 12 more than Mame Biram Diouf. Some Stoke fans may well have taken a point on the opening day. The Potters have won just once on the opening weekend of a Premier League season - 2009/10 vs Burnley. Earlier we asked you where you think Liverpool will finish. It looks as though most of you expect Liverpool to finish between second and sixth.... Only 8.5% predict the Reds will win the title, while 4.3% says Brendan Rodgers' side will finish bottom half. Max Welford: Don't understand why Rodgers focuses so much on the midfield, although the problem lies in the attack. Milner off, Firmino in. Dennis: Not impressed with Liverpool. Early showing look flat and lack inspiration. Hoping this team gels quickly. Adam Lallana is the latest player in the wars. He slaps away Marco van Ginkel's hand as the midfielder makes a peace offering after a heavy headed challenge. There's no friendly response here. This has been full blooded - if lacking in quality - and we go to the break at stalemate. Things can only get better as 90s pop group D:Ream once sang. Charlie Adam has been prominent in midfield against his old club and he starts a move for Stoke with a classy pass and ends up being the man at the sharp end of the move - shooting at goal but tamely. From 25 yards that was Adam's range but he caught it as cleanly as a drunk golfer hits a one iron. Here we have the carnage that recent Stoke attack threw up. Look at it, it's a work of messy beauty. Marco van Ginkel - 15 - saw his cross frantically cleared, Ibrahim Afellay - 14 - volleyed into a defender, Glen Johnson - 8 - fired over. Mark Lawrenson tells BBC Radio 5 live listeners that Stoke have shaded it. The possession is bang on 50-50, Stoke ahead with four shots to Liverpool's three. Ibrahim Afellay is now down on the deck, my word this game has been disjointed. He's by far the biggest threat in the Stoke side - 38 touches - the most of any of their midfielders or forwards. And from action to a bit of handbags. James Milner and Charlie Adam clatter into one another on the deck so the Stoke midfielder pushes Liverpool's vice captain. It seems Adam objected to the aggressive challenge and he's perhaps backed up by the fact the yellow card produced is waved Milner's way. That was much more like it in terms of action. Stoke will be frustrated they let those good areas slip away. Afellay's volley was travelling at a rate of knots. "There was an appeal for a penalty amidst all that, I don't think it was one, but Stoke should be 1-0 up. Joe Gomez sold himself at left-back, he was a little bit naive. Liverpool clear the ball off line - that was the best chance of the game so far. The only chance of the game so far." We have action and a lot of it. Marco van Ginkel gets to the dead ball line and his cross is deflected towards goal, forcing Martin Skrtel into an acrobatic clearance from under the crossbar. The ball is recycled quickly and Ibrahim Affelay pumps a volley at goal... blocked... Handball? No. Still they threaten, Glen Johnson... fires over from 14 yards. "I don't want to be a killjoy but this match has been devoid of any goalmouth action so far. Stoke would probably take a draw now and you'd probably argue Liverpool would too. That's what we've got, really. Two teams playing for a draw - unless anything actually happens." Dejan Lovren, To Martin Skrtel, Nathaniel Clyne injects some vigour but it's intercepted and Stoke swarm. The ball ends up back with Simon Mignolet but there's a 50-50 coming here.... BANG. Mame Biram Diouf chased the goalkeeper down and didn't pull out. Mignolet belly flopped like a Killer Whale. The referee sensibly tells everyone to get on with it. Stoke have a set piece and that often spells danger. It's 35 yards out and Charlie Adam puts the left peg on it to deliver... danger... wide. Jon Walters gets a flick but he was offside anyway. Sit down. Nothing to see here. "Jordon Ibe is a very good player. Despite his lack of experience he's very mature. Ibe's a player who's really been exciting the Liverpool coaching staff - he's way ahead in his development." Jordon Ibe, Liverpool's number 33, looks to be growing in confidence with every outing for the Reds. You can see he's being trusted to push on down the right flank, playing high up the pitch with Nathaniel Clyne offering support from deeper. This is just Ibe's 15th career appearance for Liverpool. Liverpool have focussed their efforts down the right hand side in the opening 20 minutes of the game and Jordon Ibe is the latest to threaten down there. He's tricky near the corner flag but gets fouled and Liverpool will have a dangerous set-piece position. Ibrahim Afellay is Stoke's most prominent player so far with 22 touches and there's some serious 'Ole' about his latest involvement. A combination of shoulder drops and step overs see him leave beat two men but there's no end product and some pressure from Jordan Henderson sees the Dutchman on his backside. Nathaniel Clyne just played a back pass from the halfway line with all of his team mates up field? A few jeers from the home crowd. The weight of Liverpool weighing on him? Would he have sauntered upfield in a Southampton shirt? As Mark Lawrenson tells BBC Radio 5 live's listeners that Mame Biram Diouf looks like he's wearing shorts which belong to a heavyweight boxer, the striker has a shot from range which trickles to the hands of Simon Mignolet. Liverpool force a corner as Adam Lallana's shot is deflected and a short-corner routine almost... almost gets James Milner into a dangerous position but Stoke recover. Jack Butland is on his toes in the Stoke goal to beat Christian Benteke to a ball easily, he didn't even need to dive. Liverpool have not yet found a groove, it's disjointed all over the pitch from both sides as tackles and interceptions trump slick passing. A nice touch from Stoke's home support as they break into a minute of applause. We are informed by our commentator on BBC Radio 5 live commentator Conor McNamara this is for Stuart Knowles, a Stoke fan currently in a coma. Apparently the sound of the applause will be played to him. Without doubt, the moment of the game so far. The Potters look pretty settled so far and have had the game's only shot. Possession wise they have 42% to Liverpool's 58%. We get to see the Christian Benteke-Philippe Coutinho axis in tandem but their link up breaks down. Benteke is harassed and not allowed space, prompting a break out of some meaty challenges - cue roars from the home support. Nothing like a battle breaking out is there? "Charlie Adam, with that magic wand of a left foot I expected him to just stroke the ball into the back of the net, but he completely missed it." Stoke threaten down the right flank, maybe they are targeting the young Gomez at left-back. In comes a delivery and Charlie Adam is well placed but he slices wildly when well placed 14 yards out. For one with such a sweet left-peg, that's a big opening. Joe Gomez at left-back for Liverpool is a big, strong lad for 18. Today he's grappling with Jon Walters - talk about youth versus experience. "Ibrahim Afellay had his foot up high but he was going for the ball. It's another case of the referee not knowing the game." I once remember a well-known TV pundit questioning how Barcelona's great side of 2009 would get on at Stoke. Well if a former Barcelona player - Ibrahim Afellay - is anything to base things on, they'd not have been intimidated. In his first act in English football Afellay wipes out Nathaniel Clyne in the air. They'll have felt that as far away as the Nou Camp. Liverpool will attack their own fans in the second period but for now they continue to settle in and Nathaniel Clyne wins a corner which gets snuffed out due to an infringement in the box. Glen Johnson concedes possession to Jordan Henderson who looks full of running already. Robbie, New Malden: Wasn't sure how Liverpool were going to set up this say season, but this line-up with Henderson and Milner as defensive playmakers looks very good. Top four for Liverpool this season I reckon, especially once Roberto Firmino's in the team! Lots of singing, without a ball kicked there is endless hope after all. And we are off and running. The pitch looks magnificent, it's been rolled and has that look only a summer pitch can have. Liverpool attack early but Glen Johnson is on the cover, no danger here. Can Liverpool make top four? "My feeling is Liverpool won't make the top four. I think Brendan Rodgers is under severe pressure. The players they have brought in, are they really going to get you in a Champions League position? I'm not so sure. There's no excuse. The money has been there and if the job is not done then there are going to be consequences." Interestingly, Inter Milan and Switzerland winger Xherdan Shaqiri is in the stands. Remmeber Stoke placed a bid for him but things went silent from the player's end. We have players in the tunnel. Charlie Adam looks relaxed, he's done this many times before. There seems to be some chat among officials about a sock clash and Adam's face is that of a man who things this is nitpicking. Here comes Jordan Henderson, the new club captain of course. "All the best gents," shouts an official as the players ready themselves. "COME ON," shout a handful of players. "I just think Liverpool might be going into today's game slightly undercooked in terms of the quality of opponents they faced in pre-season. "And towards the end of last season it seemed like a lot of teams had worked out how to play against Liverpool. Teams would go in strongly and Liverpool's midfield, for all their quality when they're afforded time and space on the ball, were meek and mild." Did you know Liverpool went unbeaten in pre-season? The Reds clocked five wins and a draw, seeing off the might of Brisbane Roar, Adelaide United, Thailand All Stars, Swindon Town and HJK Helsinki. Stoke stuffed Wrexham 6-0 but then lost to Brentford, FC Koln and Porto. How are the nerves ladies and gents? Around 11 minutes until we find out if your summer hope was considered or foolish. It looks like both sides will line-up 4-2-3-1 in formation. Stoke with three bodies behind Mame Biram Diouf in Ibrahim Afellay, Charlie Adam and Jon Walters. Liverpool should support Christian Benteke with Adam Lallana, Philippe Coutinho and Jordon Ibe. Match of the Day commentator Steve Bower: "Liverpool are desperate for a positive start in the Potteries - scene of one of the darkest days in Brendan Rodgers' career just 11 weeks ago." "Last season they suffered their worst start to a campaign for 22 years and never really recovered. "Given their early fixtures, Rodgers' new-look team cannot afford a repeat. He will need the likes of Christian Benteke and James Milner to use their Premier League experience instantly. "Stoke are chasing a third successive top-10 finish in the top flight for the first time since 1937." Glen Johnson made his home debut for Liverpool against Stoke in August 2009 and here he finds himself in a Stoke kit for the first time, preparing to face the club he recently departed after six years. Liverpool paid £18m for his services and after making around 200 appearances, his price looking back is probably questionable. Stoke, shrewd as they are, snapped the 30-year-old for free. He was man of the match on his Liverpool home debut. I'm sure he'd take the same here. Did you know? Brendan Rodgers has a 47.4% win ratio as a Premier League manager. Claudio Ranieri, Tim Sherwood, Arsene Wenger, Jose Mourinho, Manuel Pellegrini and Louis van Gaal have a better ratio in England's top tier. Liverpool manager Brendan Rodgers knows this is a big year for him. His summer meeting with owners Fenway Sports Group was well publicised and when quizzed on what he expects this season, his response was honest and potentially daunting. "I need to gain the supporters' trust again. It has been an absolute privilege to manage this club and have the supporters behind us," he told reporters. "But of course, you have to do well to earn that, and I know I need to earn that again. "Our first objective is to arrive in the top four. We'll look to put up a greater fight than last season." Will Liverpool's season be in tatters or flying by the time this design grows out of the gent's hair? Done and dusted at Newcastle, where Steve McClaren's side rode their luck late on to earn a point against Southampton and what about this result - Arsenal 0-2 West Ham. The players are out on the pitch. Lots of jogs, lots of shuttle runs, those limbs are being put through the various movements needed in a big game. Ibrahim Afellay is among those grafting, what a signing for Stoke he is on paper. The Potters stand in a circle, receiving instruction on what stretch to perform next. Lots of squatting, they look like sumo wrestlers. smart-phone snap from Elliot Hackney shows. The Potters won 10 of their league fixtures here last season, losing six. It's a tough place to go though, the wind whips through, so is it best to get this one out of the way in the comfort of an August afternoon? Stoke City have only featured in the Europa League or Uefa Cup three times in their history but manager Mark Hughes has set his eyes on a return to the level by next season. "We've managed to improve in each of the past two years and would love to do that again this time," Hughes told reporters ahead of the start of the campaign. "The aim is to try to get into Europe. I like to set the bar high. Having worked with the new signings I must say that I have been even more surprised by their ability than I thought I would be." So we are voting on where Liverpool will finish but send us your reasons as to why they'll end up there on Twitter. Stoke fans, we also want to know where you think you'll end up come May? Tweet #bbcfootball. VOTE: Where will Reds finish? So come on then, what can we expect of Liverpool this season? Have your say on the right-hand side of this page. Brendan Rodgers has preferred teenager Joe Gomez to Alberto Moreno at left-back and the 18-year-old, signed from Charlton is one of four men given his Red debut today. Nathaniel Clyne, James Milner and perhaps unsurprisingly Christian Benteke all start, while Roberto Firmino, Danny Ings and Divock Origi are among the substitutes. Stoke hand first starts to Ibrahim Afellay, Marco van Ginkel and Glen Johnson - who of course joined from Liverpool. Stoke XI: Butland; Johnson, Cameron, Muniesa, Pieters; Whelan, Adam; Walters, van Ginkel, Afellay; Diouf. Liverpool XI: Mignolet, Clyne, Skrtel, Lovren, Gomez, Henderson, Milner, Lallana, Ibe, Coutinho, Benteke. Stoke City's away dressing room is no frills. White walls, hard benches, there's no warm welcome here. Stoke City secured their highest Premier League points tally in 2014-15 so those summer deckchairs probably felt super comfortable for manager Mark Hughes and his team. But Hughes has been on the phone, chasing new faces to nudge the Potters forward and where there was once a club expected to scrap for survival, ambitions are now of a far more lofty nature. And the Reds don't like coming here. They have one league win at this noisy ground in seven years. On the final day of last season there were nightmares. A 6-1 defeat, where do they go from here? No more Steven Gerrard. What next for Raheem Sterling... these were difficult times. "We go again," as the departing Gerrard once cried. Judgement season for Brendan Rodgers but on day one, he faces a club on the up.